Offering vessels like this one have been found in the tombs of high-ranking Zapotec lords and noblewomen in the Oaxaca Valley in Mexico. Zapotec nobles were buried in tombs set around the central plaza of their capital at Monte Albán, which was founded in the 6th century BC and flourished between the 3rd and 7th centuries AD. This imposing site was located on the top of a hill with views of the Oaxaca Valley and surrounding mountains. The supporting population, which at its height numbered around 25,000, lived on the terraced slopes in the valley below. Royal ancestor worship was the focus of Zapotec belief and ceremonial practice and the powerful figures depicted on offering vessels - or funerary urns as they are also known - are thought to represent these ancestors rather than deities. The importance of ancestry lies in the Zapotec use of genealogy and ancestral lines to pass on power and wealth. Figures like this have been found inside tombs, positioned alongside bodies, as well as in niches in the walls. They've also been found buried in the floors of ceremonial centres, seemingly as offerings. 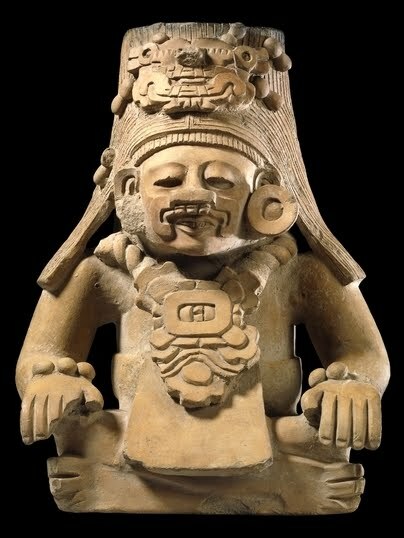 The figure on this example wears a mask and headdress representing the depicted ancestors' potent supernatural force. The chest ornament features a glyph or sculpted symbol of a day in the 260-day Zapotec ritual calendar. The exact use and purpose of these vessels is unknown. The container, or urn, itself - usually a cylindrical vessel hidden behind the sculpted figure - may simply have been used to hold perishable offerings, as remains have been found inside.